Scissors are scissors, right? Nope! 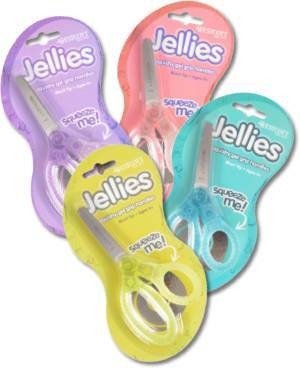 I just received a 12-pack of the new Westcott Jellies, and I can tell you that these scissors are different. They have super squishy gel-grip handles and come in fun colors. And of course they have those amazing Westcott blades that cut just right. Although I hate to let it go, you can win that 12 pack. How? Let me know the first project you’d have your students do with their shiny, squishy, crazy new scissors. (Update: Congratulations to Diane, our lucky winner!) Send your comment to this blog by Wednesday, February 13. One teacher will be randomly selected to win! 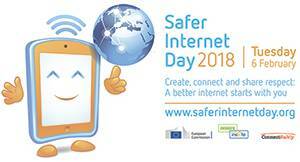 February 5 is Safer Internet Day. This global campaign is designed to raise awareness of online issues and create a better Internet for everyone. Visit saferinternetday.us to find free resources. It’s time for the annual Zaner-Bloser National Handwriting Contest. Local, state, and national champions in grades K–8 receive cash and other prizes. 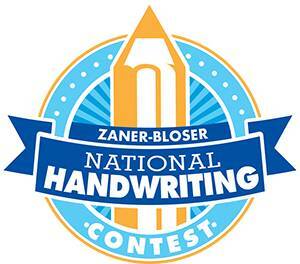 Find out how to get involved at zaner-bloser.com/national-handwriting-contest. The deadline is February 14. 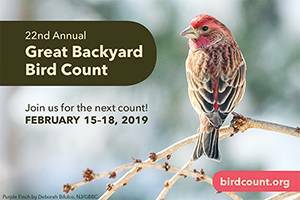 It’s almost time for the Great Backyard Bird Count. You and your students can get involved in this citizen science project at school and at home. The count runs February 15–18 and takes as little as 15 minutes. Get the details at gbbc.birdcount.org. If you want those scissors, submit your comments. But maybe our winner shouldn’t count how many are in the box too closely, one purple pair may go astray…. PS: Learning magazine has a new digital issue! It’s a quick read and has lots of fun freebies and contests. Click here to see it. Plus, after you take a look, if you complete a quick survey you’ll be entered for a chance to win $100 of children’s books. Access the survey here. We would use them for valentine hearts! Maybe cut them like snowflakes in the shape of a heart. We will use our scissors to cut out teeth for our dental health week smiles! These look amazing for my special needs classroom! Many of my students have sensory issues as well as motor skill deficits. This looks like a great way to combine getting the desired sensory input with necessary motor skills practice! These are a must try – thanks for sharing them! We’re getting ready for Book Fair, so I would have students use them to cut out dinosaur foot prints and silhouettes. I would use the new scissors for a spiral cutting project. These sound like they would be great at cutting and comfortable to hold. We would use them to make a valentine collage. We are making memory books so we would do our monthly page for that. The possibilities are endless! Valentine projects, word sorts, spring collages, etc. We’d use them on our valentine project. A craft block with multi paper cutting and layering. A decor item they can keep for themselves or give as a present to a loved one. Last year we did an Owl block of “Who loves you?” For our moms???? I would use the scissors for cutting out pictures/letters from magazines for a collage or letter hunt! These would be perfect at my small group table! These would be great for cutting out decorations for Valentine boxes. I would use them for ot pratice cutting out circles for snowmen. We cut the amount of circles as the letters of their name. It also help with counting, one to one correspondence, letter and name recognition as well as learning to spell their name. Of course I teach special education preschool. Thank you for this opportunity. I have 3 year olds. Some are still learning how to hold and use scissors. I think these would be fun! We would use them to practice cutting shapes or for free style art projects! they would be great for cutting out interactive journal pages. We will be cutting Valentines for senior citizens. With all the snow we have in Michingan…we would make snow flakes maybe a sun to melt all the snow :). I would put them in my Creative Corner center. These would be used in our handwriting and art center. Also, they would be used daily in our work. We would use them to cut everything! Hearts for Valentine’s Day! I’m an assistant teacher in 4’s and several students are still learning to cut various shapes. I think these would make cutting more fun for everyone! We would just actually use them! My co-teacher and I accidentally ordered plastic scissors at the beginning of the year for our classes. Think about that, plastic scissors…they do not cut anything. So the fact of just having some fancy new gel scissors would be like winning the lottery! We would use them to cut playdoh for building fine motor strength to prepare for writing! And it wouldn’t hurt because they’re squishy scissors! we would use them for cutting out a variety of colors to create a collage of colors heart. I would encourage the children to notice how it feels in their hands as they work the scissors. I believe these scissors would help a couple of my students with developmental delays. This is awesome for my sensory kiddos! Would love to use these to teach proper hand technique with my preschoolers! We would use them to cut and create our warm spring bulletin board crafts! See ya later cold nasty winter! My pre-k kiddos could use them for our upcoming Valentine Day projects! I’m sure they would all love them, especially our kiddos with sensory issues. What kiddo wouldn’t want to use squishy scissors?! I’m sure they’ll make cutting more fun! My kiddos would use them to come out black history month posters. Where students complete research and the create a graffiti map using letters from magazines and newspapers to spell out words that represent that person. Since I have more time Han 12 students I would use them for rewards. Earn so many Dojo points a week and you get to use the squishy scissors. They would be used in Art, the area I work in. My kindergarteners would use these to cut hearts for Valentines Day/100th Day activities! I’m thinking flowers or something to help us think Spring. It’s – 50 here, and we are missing 4 days of school this week! I would have my students decide what to cut out to say how grateful we are for these terrific new scissors! A final “Look how I can cut!” A special project my students will do for one of thier pages in their memory book. I give a special memory book to all if the parents featuring project from the first day of school to the last. These would be great for cutting out letters every week! These are such cool looking scissors. My class of 26 4 year olds would LOVE them! We would use them to cut out hearts for our Valentines project. I think the gel would be great for sensory input and help some of my kids who struggle with cutting. I would use them to practice cutting with my kindergarteners-maybe some cute hearts for Valentines Day! I would have them do an art project. We would use them to cut our Valentine’s project…a wreath made of our hearts with wishes written on them. We would definitely make super cute valentine cards to give to the patients at Roswell cancer institute ! Lots of glitter too lol ??????????? ?‍♀️ Hearts full of glitter are sure to brighten anyone’s day ???? We would make Valentines for our custodians and secretaries. I would have the students cut out hearts for Valentine’s day. We will use them to make Mardi Gras masks. Can’t wait! These would be great for any number of my craftivities and for cutting things for their interactive notebooks! We will make Abraham Lincoln with these fabulous scissors! Polar bears for our arctic theme! Omg! My left handed kids would love these, it’s so hard for them when trying to write and cut these scissors would bring great relief. The squishy scissors would also be excellent for my students who have week fine motor skills. I would test them out myself at home with my daughter as we are boh left handed and I’ve never mastered cutting skills myself. At work my class are starting an interest project om transport so would use these scissors to create different transport types witj boxes and paper. I love these scissors! We have two projects coming up one is a poetry project where they will be cutting and pasting designs and pictures to match the theme of their poem to display. Then our next project is their kindness and craft writing for our kindness bulletin board. Thanks for doing the contest. We would use them to cut different things out for our learning books. We are making number, color, shape and alphabet books. Our Tiny Tots are working on the alphabet – one letter a week – and February celebrates C for Chinese New Year; D for dogs, dinosaurs and daddies, and E for eggs and eating (the week before Read Across America Day. So we would use the new scissors for cutting lisee, doggy masks, and green eggs and ham headbands! We would use them to snip papers as we are just learning about scissors in our class! I would love to see how my third grade students with OT difficulties would do with these! What a great idea! It is crazy how the scissor has not had any update or modifications before this! We always need new scissors! Private school problems! My class would use the scissors to cut out shapes so they can find the area and then make composite figures with the shapes. We would use them almost daily! Cutting items for our interactive notebook, art activities to accompany our writing and of course hearts to pass out to other school personnel! I would use them daily! I teach pre K and great scissors are rare. We would use the for our N ninja this week as well as hearts and a groundhogs or 2! We would use those scissors to make Valentine’s Day crafts. I teach 4th and when you get to this grade, it’s all about preparing them for the test. To take the stress out of this grade, I try to implement a few “craftivities” to get around teaching to the test by having some fun while still covering the standards. These scissors would make a great addition to my class and the first project would be Kindness hearts for Valentine’s day where each child will cut out a heart and give compliments to their classmates. 🙂 Thanks! In my kindergarten classroom, we love Disney we would use these news scissors to do our mickeys magic of kindness project for Valentine’s Day. We are going to talk about how kindness is magical and then make valentines for people we think need a bit of kindness to cheer them up. It can be anyone they think of in the school or at home and then we will deliver the magic of kindness to that person. I would have my students use the scissors to cut up straws, count the parts, and make necklaces out of the small cut-up pieces. I would also allow for them to cut up shapes, such as hearts, triangles, squares, and circles. My preschoolers would cut yarn and tissue paper to make collages. we would use them for our Valentine’s Day hearts. We would use them to make shamrocks and leprechauns for St. Patrick’s day. I figure it will be close to March when we get them. We would use them to cut heart to decorate our Valentine boxes! My students will be practicing their cutting skills. We would cut paper for a Valentine project. I teach 3 year olds and these scissors would be a fun and exciting new tool to work on those fine motor skills. During holidays I like to put different types of paper (wrapping paper, construction paper, tissue paper) into my sensory bin and let them create whatever they want!! We would use these scissors all the time! I am constantly working on cutting skills with my first graders! Our monthly crafts will be perfect for using squishy scissors! Students use scissors everyday in our classroom! They would LOVE these, especially since they all want the same three pairs of Wescott scissors that we have instead of the 12 off brand ones. The first thing they would cut is their word sorts! I would use them to show off their cutting skills by making fun shaped cards to send to local children’s hospital or nursing home to brighten their day! Our focus for February is kindness and service learning so this would be a perfect tie in to our curriculum goals. My students can use these every day! I’m so ready for spring and these scissors will arrive just in time for Easter. There’s flowers, bunnies and eggs to be cut and cards to be made. There’s so many great projects we could do! They would be added to our Elementary Media Center’s make it space. The students would love them! I teach self-contained Special Education with students from Kinder through 8th grade. For students with tactile issues, these scissors would be perfect For learning to hold scissors, these would have a comfortable grip student will love. We continually work on mastering cutting skills. This month we are working on cutting out Valentines-lace hearts for their mother’s card/gift. Next month they will be cutting out shamrocks to give to all of the staff. We would love to win squishy scissors. I would have my kids use them to cut out different shapes to make a shape picture! We would use them to cut out shapes to make patterns to decorate our awesome work wall. I have an entire class of low-income students, students that sometimes move often. Many of my scissors are sometimes given because the kids don’t have any at home. I would use these scissors for a Mother’s day project to cut a self portrait of themselves!! We would use them with our interactive ELA journals. When we return to school we will be getting our next writing craftivity into high gear. It’s all about the love of Valentine’s Day! My class LOVES to cut. So we would cut out heartsfor Valentine’s Day and we having cutting stripes with different cutting exercises on them that they love to do. I incorporate cutting activities 3 times a week to help my students in special education with fine motor deficits. Thanks for the opportunity! Introducing scissor skills is important in our little classrooms as they gain their fine motor skills. These scissors look like they would be perfect for little hands and they would enjoy the squishy feel! I would use it for snowman store. We first make a snowman shape using paint & potato mashers. Then I set up a store & give them 20 pennies in a little wallet. They use money to buy accessories for their snowman. They have to have a face, but there are different prices on all the items and other accessories are optional. They do not have enough money to buy everything. So they have to decide what they really what. Some items like hats and scarves they will need to cut with scissors. I would love these scissors to use at the snowman store. At the end of the project they add up the cost of each item and the total cost of their snowman. Snow much fun!!! If I had these scissors, the first project I would do would be creating nets for geometric solids with my students. Students will cut out the nets and create their solids! My Kindergarteners would use the scissors to make cards for an outreach project and to make valentines and hearts! We would use them for a Valentine’s Day project. We would use them for our Dr. Seuss project coming up at the end of the month. I would love to try these for my sensory defensive students that do not like to touch hard handled scissors. (They only tolerate touching soft things). We would probably start with cutting tissue paper squares to make a stained glass type project (spring or St. Patty’s day symbol) to hang in our window. I would use these scissors with my 1st grade intervention group. They struggle to cut and I would love to see if Jellies would support their grip. We would cut out our favorite books from a magazine and collage them on paper! We would use them over and over and over again! Starting with Valentine’s day and then many of the great ideas in the other posts! These look so much fun. I am an early childhood teacher and graphic artist ( I would use them in my digital hybrid scrapbooking ) and distance school my two super children. We would use these to cut out our new sight word bundle cut and paste we just got. We are doing a year long kindness project at our school. Kids cut out hearts and write examples of kind acts seen or done and post them all over the school building. These would be great incentive for them to do more. My Pre-K students would use Jellies to cut straws and other small items as part of a fine motor obstacle course. I would use them with our Pre-K kiddos for a Parent card for Valentine’s Day! We are starting to learn about the Bill of Rights. I would have them cut out “peace” birds for a mobile that represents the first amendment. Wind beneath our wings project. We would use them to cut out hearts to give valentines to a nursing home. We’re going to make Hedgie the Hedgehog out of hearts with our little hands! The kids in our preschool classes could use these scissors to cut out the pictures of their friends to attach to Valentine’s Day cards! These would be great a great tool for my special ed. students with sensory needs. They would first be used for our Valentine’s projects! Thanks for the chance. I would use them in our classroom Sci-Tech lab to continue making mini journal booklets about all our science experiments. When I think of the Gel handles, I can relate it to properties of matter. COOOOOL! We need those. SNIP, SNIP!!! Even more so with fun scissors! I would first use them to cut out Valentine holders. The first thing we would cut out would be teeth! My first graders have a difficult time cutting details, dental health is a good time for paractice.